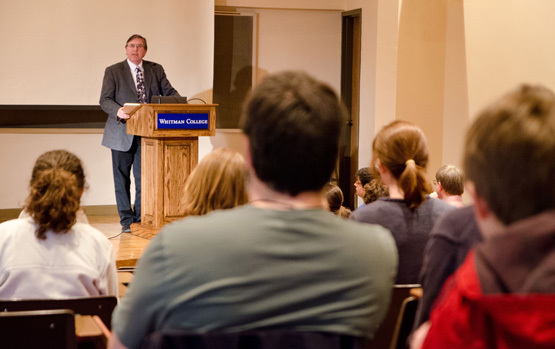 “History illuminates the present,” said Whitman’s David F. Schmitz, Robert Allen Skotheim Chair of History. If past is indeed prologue then five of Schmitz’s history students illuminated the present for those who attended the annual History Honors Conference on Friday, May 4. Presenting from portions of their senior honors theses, Carolyn Hart ’12, Brynne Haug ’12, Omar Ihmoda ’12, Elizabeth Reetz ’12 and Gabrielle Westcott ’12 provided historical context to topics ranging from former Secretary of Defense Clark Clifford to the Medieval Welsh March. The conference was a celebration of these five students in recognition of their academic rigor. It also showcased each student’s specific talents. “We ask a great deal of our honors students and they do great work, so it’s nice to organize an event that highlights what they’re doing,” said Schmitz. Presenting their research publically also gave students the chance to share their ideas with an audience beyond their advisor or just reading their dissertations to family members. 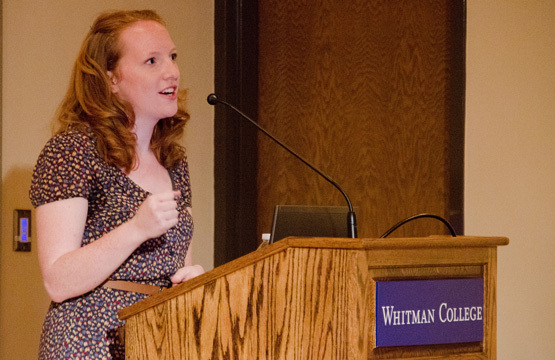 The intellectual challenges of writing and presenting her honors thesis enabled Hart to understand her true academic potential. She said that the academic demands she experienced are part and parcel of a liberal arts education at Whitman. “Whitman helped me develop as a person, determine my interests and define my own goals,” said Hart, who this fall will start law school at Georgetown. The five students who participated in the conference agreed the entire process allowed them to cross the threshold from student-scholar to what they defined as a “real” scholar. Presentations like Ihmoda’s gave attendees snapshots of history normally not animated. “A conference like this is important because I get a different perspective on what other students are working on,” said Susannah Ellis ’14, a theater major.